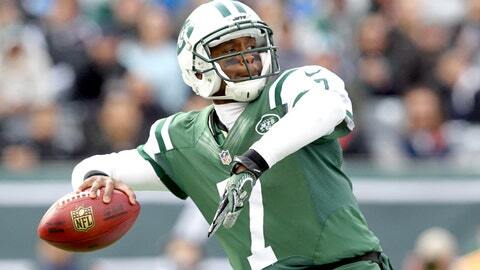 Geno Smith completed 4 of 10 passes for 29 yards and an interception in Sunday's loss. The Jets’ coaching staff pulled the plug on Geno Smith at halftime during Sunday’s 23-3 loss against the Dolphins. On Monday, they informed the rookie quarterback that he’ll start next week against the Oakland Raiders. Quarterbacks coach David Lee gave him the news that he will remain the starter instead of undrafted free agent Matt Simms, according to Smith. Veteran quarterback David Garrad later confirmed the news. "I believe in Geno," Rex Ryan said via Newsday. "I think he has the tools to be a good quarterback in this league." The quarterback situation in New York might be one of the bleakest in the league. Ryan’s future is on the line and will likely be dictated by the way the Jets play in the final four games. Smith, who was selected with a second-round pick in last year’s NFL Draft, will need to show some big progress if he has hopes of having a long-term future in New York.